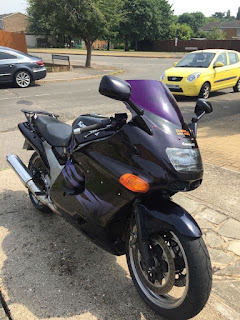 Hayling Island Labs - After Hours: Have a new (to me) motorcycle ..
Have a new (to me) motorcycle ..
And she is lovely .. ZZR1100 1995 (D3). Unfortunately the former owner forgot to tell me about the issue with starting from anything other than cold. It happened to me once on the way back from Southampton on my first outing, but it was really bad the first time over to the Isle of Wight. I bump-started the dang thing five times in one day! It just clicks when I press the starter .. so I changed the battery (no improvement), changed the starter solenoid (no improvement) so it's on to the starter motor. Since I really need the bike to get to work - especially on the Isle of Wight, I thought I would buy a new one rather than try to refurbish the older one. So I went to a reputable bike bits supplier, and they duly sent one for a rather large lump of money. Part duly arrives, set aside some time this Bank Holiday weekend to do the swap. I eventually got down to the bit in the bike - removed petrol tank, disconnected battery, removed lower side panel, removed alternator (eventually! had to go and buy a long allen key to get to the bolts required) and then removed the old starter motor. This at least avoided the guidance in the service manual which says Remove Fuel Tank. Remove Carbs. Remove Engine Oil. Remove Engine. 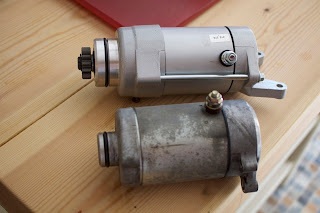 So, out comes the old starter motor and I go to unbox the shiny new one. And, guess what? It is completely the wrong one. The picture in the advert was the correct one, much like the one closer to the camera below. Unfortunately the one further away in the picture is the one they sent. It has the wrong size, wrong fittings, wrong oil seal size and the wrong pinion. *sigh*. So I may end up trying to repair old one instead. I have cleaned it all out (it was a big mess inside), checked the armature which seems to be connected in all the right places, and insulated in all of the (different) right places, and I have a kit of bits coming from the very capable Wemoto to replace the brushes and springy things, and I hope for a good result. Meanwhile, catching the bus and stealing the car from wifey, who is very understanding.